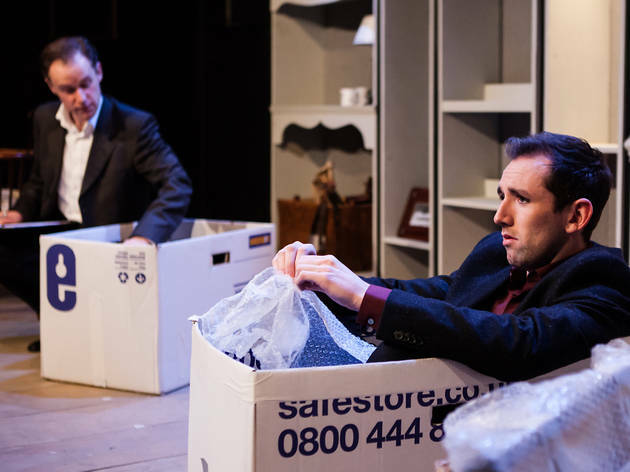 Iain Finlay Macleod's play about an awkward entrepreneur who loses everything except the Scots Gaelic of his childhood received warm reviews upon its 2011 Edinburgh premiere under the auspices of the National Theatre of Scotland. But Russell Bolam's slightly stilted London production feels less assured. At its core is an affecting drama about language and self. Born and raised on the Isle of Lewis, James (David Carlyle) lives a fun, superficial life in Hampstead, having made his fortune selling advertising as a teenager. He lives in a house full of fabulous junk with his beautiful wife Alison (Emily Bowker), but something is nagging him – raised a Scots Gaelic speaker, he has forgotten the word for 'somersault', and from his obsession with that small chink in his identity, his entire life seems to fall apart, causing him to retreat to Lewis to be with his dying father. 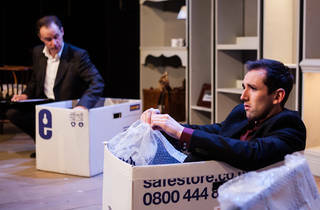 But a series of odd flourishes obfuscate the play's plangent core, and Carlyle's fine performance. The chronology leaps about with needless messiness, while creepily existential debt collector character Barrett (Richard Teverson) seems to have wandered in from another play entirely. And a coda in which the cast talk to the audience about 'their' experience of growing up as Scots Gaelic speakers may be heartfelt writing, but – coming from the mouths of well-spoken English actors – feels like an unwieldy affectation.